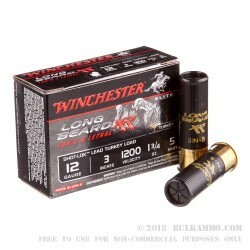 The Elite Long Beard XR line of shotshells features Winchester’s proprietary Shot-Lok technology, a copper-plated shot encapsulated by a special hard resin that fractures to buffer pellets and combat deformation. 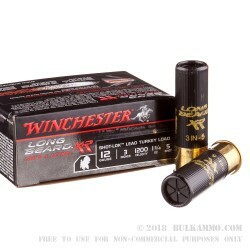 By eliminating misshapen shot, shells with Shot-Lok technology effectively increase your range by delivering twice the pellets in a 10” circle out to 60 yards than another traditional turkey load would. That gives you an enormous advantage when you’re after those perceptive and flighty toms. 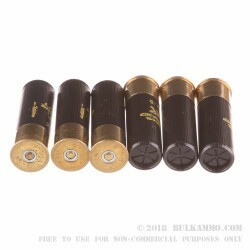 With its 1,200 fps muzzle velocity and tight pattern, this shell offers devastating penetration and power upon impact. 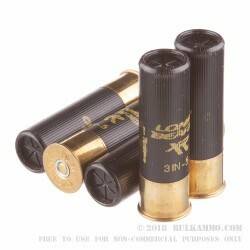 That makes it appropriate not only for turkey hunting, but for personal defense as well where you would favor the use of a shotgun. You can’t go wrong banking on Winchester, with their several decades of commitment to excellence, when choosing a shell for any application.